Ever felt like you're being eased out of something? 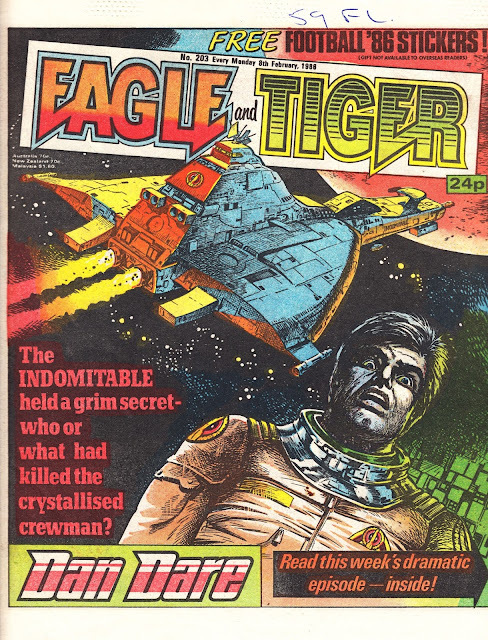 THE TIGER must have started to have a few suspicions in February 1986 when the EAGLE masthead was suddenly redesigned, significantly reducing Tiger's logo in the process. The coming together of equals was starting to look like just another merger. 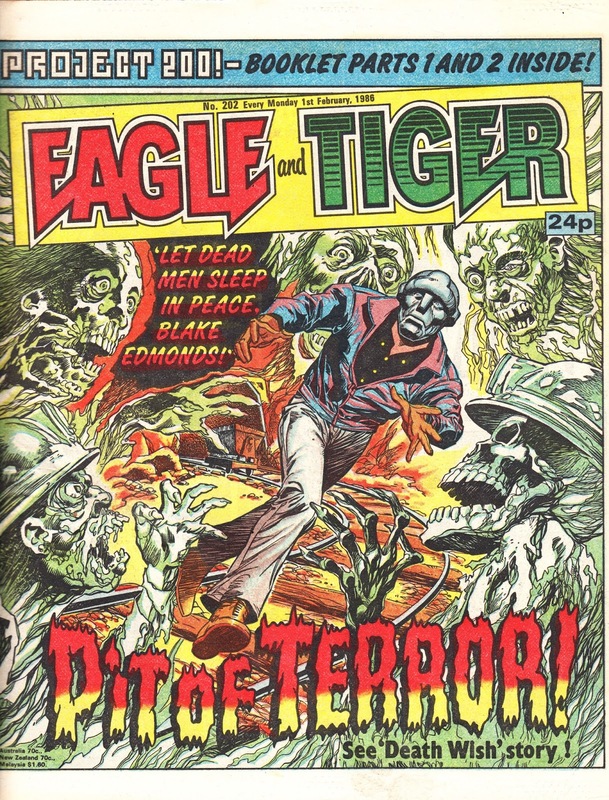 The cover of issue 204 was pretty shameless. Not only does the colouring of the "rogue robots" text look suspiciously like the logo of a well known giant robot toy line (whose comics license resided elsewhere) but Dan's nemesis is obviously one of the ROBO-MACHINES. Shame. Shame. Shame. 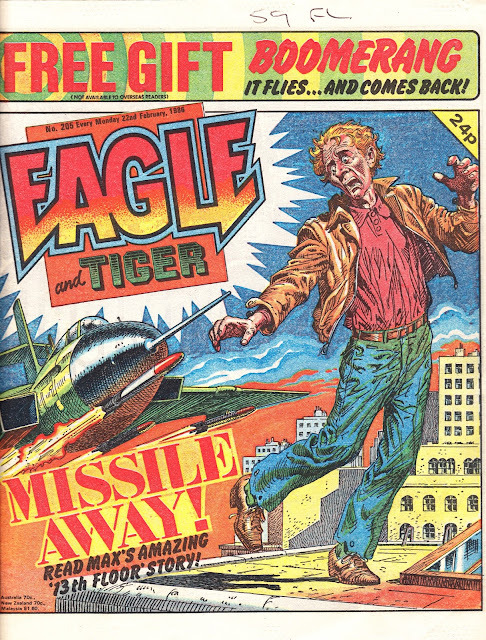 Issue 205 featured a free cardboard boomerang which - if my memory serves - was fairly useless. It WAS just another merger, although for a time it seemed as if complete equality had been achieved; certainly Tiger appeared on Eagle’s cover a lot longer than Whoopee did on Whizzer & Chips’. There was no real question as to which of the ‘two’ comics had the upper hand, regardless of longevity, so it’s not surprising in the least that the Tiger logo eventually shrank. The smaller logo was first seen on 16/2/85, in what now looks painfully like a last-ditch attempt to revitalise Tiger, and had a lifetime of just seven issues, while a year on it was seen between 22/2 and 14/6/86 before disappearing for good. 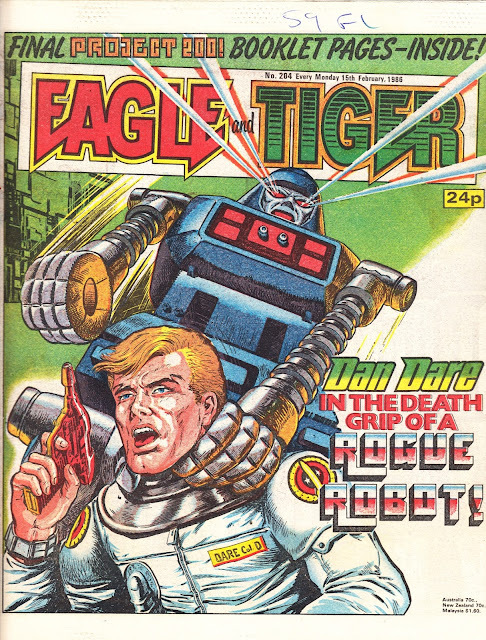 Still, 17 cover appearances beats seven any day - and we’d still got Blake Edmonds along with Hotshot Hamish and (latterly) Billy Dane in Roy of the Rovers for a few years yet.